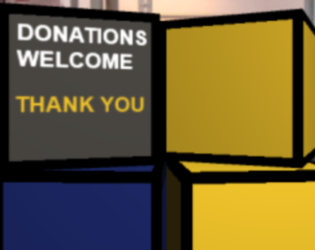 Left-click to donate money in a box. A prototype for the DCA Artcade, an interactive donation stand at Dundee Contemporary Arts. This was one of three games I built for the Minimalist Game Jam at Abertay University. This game in particular was made for a brief that challenged jammers to create a game that used only three pixels and twelve colours. It was judged as one of two runners-up in the jam.